Lieutenant Colonel Richard Ellis Nelson was born on May 5, 1912. His mother's name was Altha and his father's name was Wilbur. He had two younger siblings, a brother, Robert and a sister, Jean. The Nelson family lived in Modesto, California, the county seat of Stanislaus County. By the time he enrolled into high school, the Great Depression was racking the country with debt, unemployment, and sorrow. At age 21, on July 1, 1933, Richard enrolled in the United States Military Academy at West Point, marking the start of his military career. At West Point he played football and lacrosse. He was a well-regarded, competitive young man. 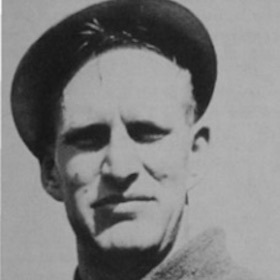 After graduating in 1937, Richard reported to Fort Clark in Texas. Agriculture is one of the last things that one would think of when you think of war. However, agriculture in California was one of the state’s biggest contributions to the war effort. Once the war started the majority of agricultural fields and services in California cranked up to meet wartime demands. Due to the diversity of climate and terrain such as mountains, deserts and beaches in California, the state became a hotspot for military training. It was also one of the leading manufacturing states. Liberty ships, rubber, aircraft, and ammunition factories kept California citizens employed during this wartime era. And impressively California produced more planes than any other state and built 1,500 ships. For all of its great contributions, California does have a few blemishes on its World War II history. After the bombing of Pearl Harbor, many Americans were fearful of Japanese Americans being spies for the Imperial Empire of Japan. As a result, President. Roosevelt ordered Japanese Americans into internment camps, of which thousands of Japanese-American immigrants and citizens living on the west coast were sent inland. This was a prime example of xenophobia. Executive Order 9066 greatly impacted the California agricultural workforce, since many Japanese Americans worked in the industry. Of the 10 internment camps, two were located in California’s interior. Due to the labor shortage, many people from Mexico migrated north under temporary work visas permitted under the Bracero Program. This too would bring about ethnic tensions between U.S. servicemen and Braceros that would climax in June 1943, commonly referred to as the Zoot Suit Riots. After graduating from West Point and moving to Fort Clark, Nelson was ordered to Fort Myer, Virginia in 1939. There, he met and married Barbara Kiefer, of Massachusetts, a year later. He played polo, which he loved to do, for both the Fort Clark team and the Fort Myer team after being stationed there in 1939. It was unusual for a married man to be stationed at Fort Myer, located in Arlington, Virginia, because it was reserved for unmarried officers, as they routinely worked at the White House. However, Nelson was there under special pretenses; he was being groomed and closely watched by General George Patton, for Patton believed Nelson had the makings of a great officer. 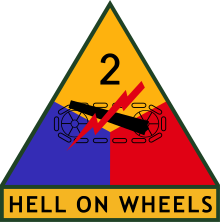 Two years later after the realization came that a horse cavalry lacked effectiveness, Nelson moved to Fort Benning, Georgia to be integrated with the 82nd Armored Reconnaissance Battalion of the 2nd Armored Division, also known as “Hell on Wheels.” The main armored vehicle, though not the only vehicle of this unit, was the M-8 Greyhound Armored Car. As a Reconnaissance Battalion, their main objective was to scout ahead of the front line. As a result, a fast vehicle was needed and the M-8 supplied this along with protection from small arms fire. It also had a 37mm mounted cannon. During 1942, Nelson commanded his own tank battalion, seeing action in North Africa before heading to the Normandy coast. For the Normandy Campaign, Nelson was reassigned to the 67th Armored Regiment. After landing on Omaha Beach on June 9, 1944, the 67th Armored Regiment, 2nd Armored Division set boots (or wheels) on the ground. 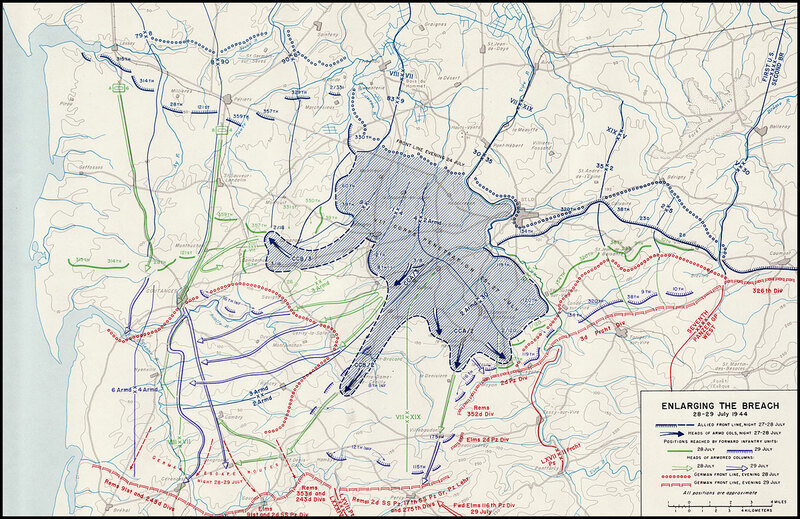 Nelson and his battalion supported Allied forces and their further push into Axis territory for over two years. 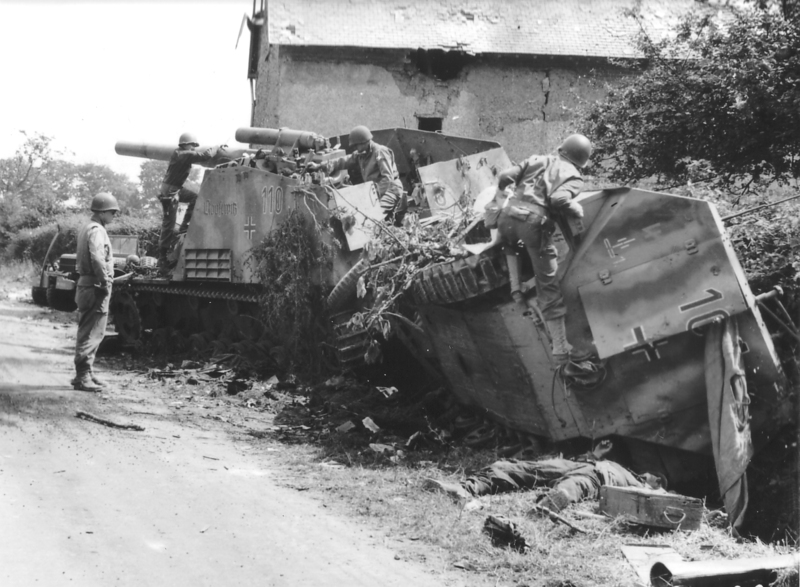 One afternoon as his battalion was conducting maneuvers southwest of Saint Lô, France, his tank took a direct hit from a German artillery shell, Nelson was fatally wounded. 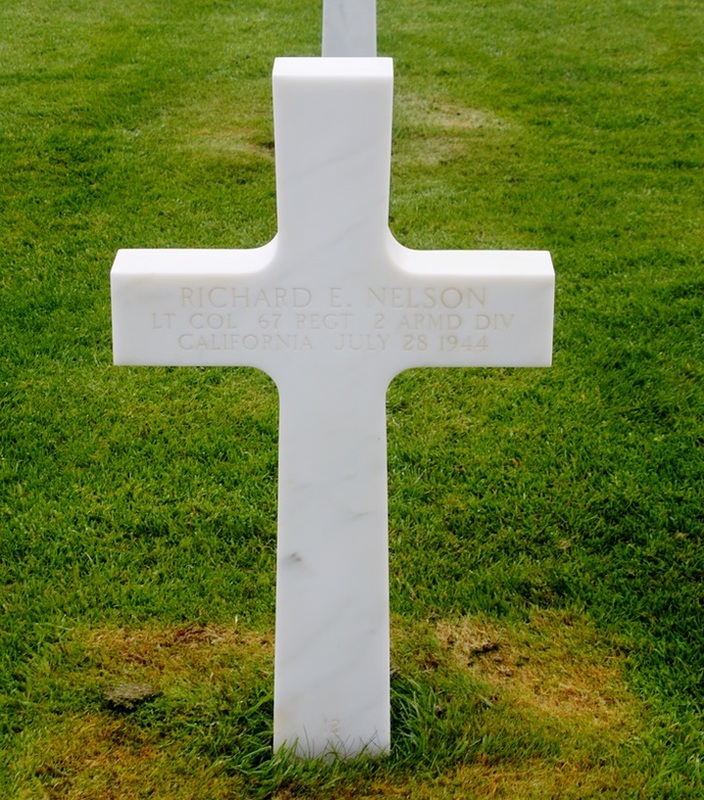 On July 28, 1944, at the age of 32, the story of Lieutenant Colonel Richard E. Nelson came to an end. In all, he received the Silver Star, Bronze Star, and Purple Heart for his heroism, bravery, and sacrifice. My name is Christopher and I came to know and respect Lieutenant Colonel Richard Ellis Nelson through a high school history project. Through this project, I realize that I am just one of the millions that Lieutenant Colonel Richard E. Nelson protected with his sacrifice during World War II. Richard Ellis Nelson was born a simple man, but lived to do great things. He was a fighter, he was passionate, he was clever, he was a leader. Richard’s career led him to command an entire battalion within the 2nd Armored Division. He was a beacon of hope and an inspiration to many people. The men he commanded had to have looked up to him and respected him greatly. To me, he was a hero in the literal sense; the physical embodiment of “Superman.” He lead a reconnaissance battalion, going ahead of the main infantry forces to ensure their safety as well. It is evident through his actions, he really cared for the well being of others. He really cared for what he did, he wanted to stop at nothing to prevent any further wrongdoing from happening to any innocent souls. He pushed on through North Africa, leading the charge in Europe to carve the way for good. Sadly, his life was cut short by such ambitions. But it was for just and noble cause and his actions will never be forgotten. He has helped greatly in shaping the world to what it is today. He was missed then, and he is still missed now. War will take all - brothers, father, privates, sergeants, officers and civilians. Nobody is safe. Not even men as highly placed as Lieutenant Colonel Richard E. Nelson. After researching my Silent Hero, I feel at a loss in a way. I never knew him until now. But when you get to know about someone’s personality, their education, their loved ones, the people they have met and left their mark on, then come back to the reality that they are in fact gone, the sense of loss is strong. As mighty as this person was, they were taken, all of our fallen heroes. Stopped short when they still had so much to give and after they had already done so much. It just comes at you in a different light. Now I feel as though I have known Richard. There is nothing that I can say or do now that will change anything in his concluded fate, but I have done my part to chip away at a forgotten past, though insignificant as it seems, this will honor his legacy, so that it may live on and I am honored in doing this for him. California. Inyo County. 1930 U.S. Census. Digital Images. http://ancestry.com. California. Inyo County. 1940 U.S. Census. Digital Images. http://ancestry.com. "Modesto - Pre WWII." 1940s Modesto. Historic Modesto, Accessed May 30, 2016. “Normandy American Cemetery." Normandy American Cemetery. American Battle Monuments Commission. Accessed December 2015. https://www.abmc.gov. Richard E. Nelson. U.S., Headstone and Interment Records for U.S. Military Cemeteries on Foreign Soil, 1942-1949 [database on-line]. http://ancestry.com. Richard E. Nelson; World War II Army Enlistment Records, 1938-1946 [Electronic File], Record Group 64; National Archives and Records Administration [retrieved from the Access to Archival Databases at https://aad.archives.gov/aad/, 01/14/2014].